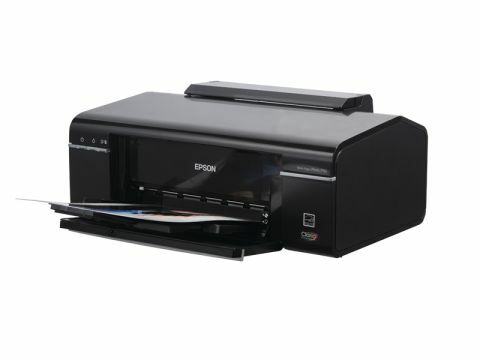 The brand-new Stylus Photo P50 printer from Epson is the successor to the venerable Photo Stylus R285 and, despite a shiny new black coat that gives it a much more up-market look, there are a lot of similarities between the two. At the most fundamental level, the P50 runs on exactly the same cartridges as its predecessor, which is no bad thing as there's a lot to be said for the time-honoured photo printing mix of dye-based cyan, magenta, yellow, black, light cyan and light magenta inks – especially when you're getting the quality of Epson's Claria inks in individually replaceable cartridges. If you're looking for fancy frills and exotic features, you'll have to look somewhere else, as the P50 has nothing in the way of standalone or direct printing facilities. Not only are there neither card readers nor an LCD screen, but also the printer doesn't even include a PictBridge port for printing from compatible cameras. In our view, this isn't too much of a disadvantage because we always tend to edit images on a computer to some extent before going to the expense of printing. Speed isn't breathtaking but the P50 proved a full minute faster than the older R285 for top quality A4 printing in our tests, with crisp, vibrant yet very natural image quality.